Gear Up Official KU and Kansas sports clothing, jerseys, posters, gifts and more for the whole family! By entering the contest, you are Opting In to receive special promotions or alerts sent to your email address. You may always Opt Out at any time. • Drawing will be held at random from all entries received by April 20th at 5:00PM CDT Drawing will be held at approx 5:05PM CDT. No purchase necessary to enter. We reserve the right to alter, end, amend, or change any aspect of this contest at any time (including prize) at our discretion and/or without notice. • Multiple entries will not improve chances to win. 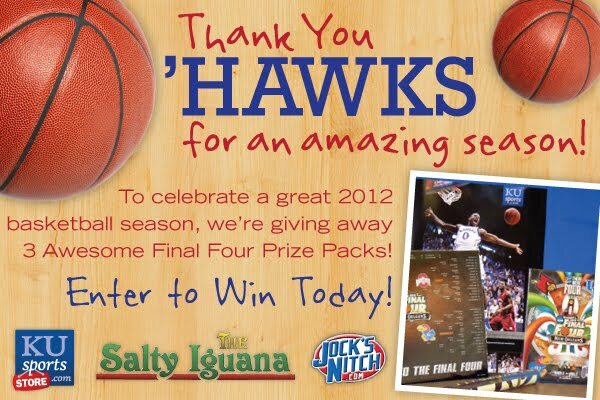 Employees of The World Company, Salty Iguana or Jock's Nitch and their immediate family members are not eligible to win prizes. By submitting an entry to this contest, entrants guarantee they are at least 13 years of age. The winner also agrees to allow the use of his or her name or image in marketing and/or promotional materials without compensation. • We cannot accept responsibility for any loss or damages that may result directly or indirectly from this contest, including damages resulting from spoilers, cancellation, or alteration of the prize. Submitting opinions, articles, photographs, poems or other creative works ("submitted content") to KUSports by way of any of our online content submission forms signifies your granting to The Journal-World a nonexclusive license to publish, copy and distribute that submitted content, while KUSports acknowledges that you are the author of the content. You grant KUSports permission to publish and republish this submitted content without restriction, in all formats and media now known or hereafter developed, including but not limited to all electronic rights. Solely by way of example, such rights include the right to convert and store the submitted content on CD-ROM, DVD and other current and hereafter developed formats, the right to place the submitted content in whole or in part on the Internet and other computer networks, and the right to electronically store and retrieve the submitted content in electronic databases.